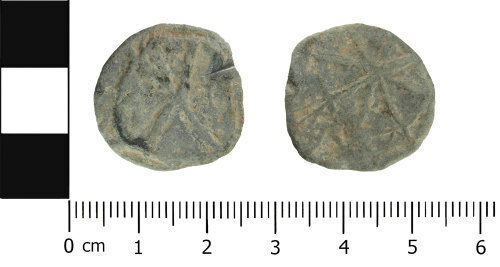 A cast lead alloy biface token, likely of post medieval date (c. 1500 - 1800). The token is circular in plan with one face featuring a raised circular design in the centre in the middle of which is a large 'X' in relief. The other face features a cartwheel design. Tokens were easy to make and distributed widely throughout a large period of time; therefore, they are difficult to date precisely. Those decorated to resemble Medieval long cross pennies continued to be circulated throughout both the Medieval and Post Medieval periods and a general date of c. AD 1250-1800 is given. They have a huge range of designs which were not necessarily related to function and could have been used for various purposes such as counting, gaming, farm or tavern tokens or possibly even as weights. Those carrying initials are generally deemed to be Post Medieval in date (1500-1850 AD), those which seem to mimic Medieval penny designs are deemed to be Medieval, the remainder which carry stylised designs remain difficult to date but the majority are probably Post Medieval in date c.1500-1800.